The Disney Princess Half Marathon registration opens to everyone TOMORROW! Have you decided yet if you are going to be doing it or not? I sadly won't be doing it in 2016, as we have a couple of family events to attend next year that we are saving up to be able to attend but man, if I had unlimited funds, I WOULD BE DOING THE RACE! No questions asked. It is really that awesome. Yes I was 29 weeks pregnant when I ran mine. Yes it was hotter than hades on a nice balmy day, and yes, my body hated me for the rest of the day, but it was TOTALLY worth it. The experience of running in my first Disney race, which is something that I had wanted to do for years! but the experience of it all. All the women coming together. To be healthy, to try something that seems impossible to so many. We did it! I DID IT! And I will never ever forget my experience of it. All 13.1 miles. (I may have zoned out for a mile or 2 in the beginning but still!) I remember the whole experience. Put this on your race todo list if you can't do it in 2016. You want to! 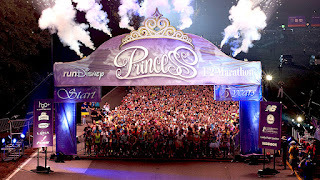 Check out my tips for the half marathon!